UNITED NATIONS, January 17 -- In the UN General Assembly on Friday night, the question asked was who cares more about the people of Palestine? At the end of two days of debate about the war in or on Gaza, there were two competing draft resolutions. GA President Miguel d'Escoto Brockmann started it, with a what he called a presidential text. This could only be passed by consensus. After close of business on Friday, it became clear if it hadn't been before that there was no consensus. And then the games began. D'Escoto withdrew his proposal, and immediately called on the representative of Ecuador. She re-introduced d'Escoto's draft as her own, amending it to demand an unconditional withdrawal from Gaza by Israel. Egypt's Ambassador immediately protested, first saying he had held up his name plate -- or "flag," as he called it -- before "the lovely woman" from Ecuador, as he called her, to groans from many in the audience. Then he criticized d'Escoto for not putting to the vote a compromise he had reached with the European Union, which also referred to the plight of Israeli civilians. 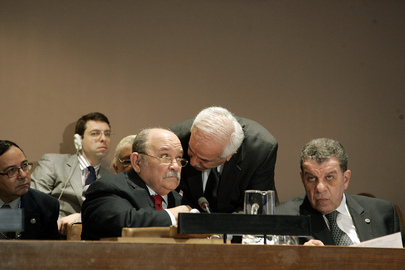 The Permanent Observer of Palestine Riyad Mansour also spoke up for this compromise, urging the Assembly to vote on it and not Ecuador's more divisive proposal. Mansour had told the Press earlier in the day that he thought d'Escoto's draft would pass, "but I'm not saying I'm happy with it." Inner City Press video at www.youtube.com/watch?v=kdUAg0q21Qc. D'Escoto adjourned the meeting. Out in the hallway, the Ambassador of Syria spoke to a group of diplomats by the coffee machine. Inner City Press went to the floor of Conference Room 3 to get a copy of Ecuador's just-printed amendments. Various Ambassadors approached to tell Inner City Press that this was "sad" and "another example of how broken the Assembly is." An Arab diplomat said it would be funny if it were on another topic, but not the bombing of Gaza. A Western Ambassador, Permanent Five member of the Security Council, said that Israel might be best helped by a vote on Ecuador's draft. D'Escoto's spokesman graciously explained the jockeying about the rules, saying Inner City Press should be rewarded for working so hard, and so late. But many Ambassador stayed to nine p.m. The war in or on Gaza has gone on for more than three weeks. It finally ended with a whimper, not a bang. Egypt called for and won a procedural vote, to put its proposal before that of Ecuador. Then Egypt's and the EU's draft was adopted, and all that was left to fight about was whose vote was mis-recorded, and who hadn't been allowed to vote. Cape Verde's representative screamed that he had, in fact, paid his dues, and anyway was were Afghanistan and Bangladesh allowed to vote? People laughed, and garbage time was entered. And in Gaza the bombs kept falling.